But you’ll never be as cool as the girl who hunts wolves with her eagle. 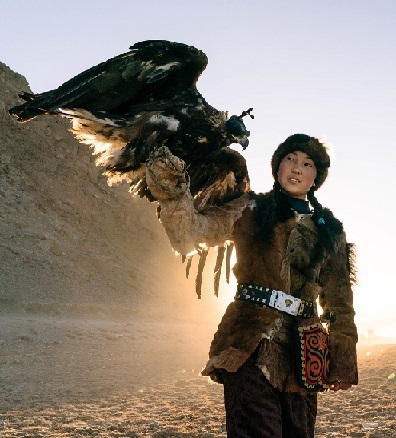 At 14, She Hunts Wolves and Takes Selfies With Cherished Eagle in Mongolia. BAYAN-OLGII, Mongolia — When school is done on Fridays, Zamanbol heads back home, finishes her homework and does her chores as typical teenagers do anywhere. On Saturdays, she saddles up her horse, treks deep into snow-capped mountains and hunts wild beasts with a trusted partner: her trained bird of prey. Actually, the most amazing thing about this story is that it is somewhat pro-hunting, and it is in the New York Times. Somewhere a Democrat’s head is exploding. Up to Here in Deer: As Fewer Vermonters Hunt, the Growing Herd Is Becoming a Problem. Chittenden County forester Ethan Tapper surveyed the scene with dismay. The woodland was “a little ecological disaster zone,” he declared. White-tailed deer had ravaged the area, Tapper said as he crouched to examine a cluster of three-inch-high ash saplings in a thicket of ferns. Hungry deer had munched them down to the ground repeatedly, he said. The acres of maple and ash seedlings all around him had been decimated. As a result, no understory of trees is growing to replace the overstory of 80-year-old maples. The forest is open to an invasion of buckthorn, honeysuckle and other nuisance species. Go read the whole thing. But to the point, forward the Vermont article to anyone who questions why people should hunt. Hunters Sharing the Harvest is a charity that works to donate food to homeless shelters and similar organizations. From crosshairs to the food bank: how deer feed the hungry. The article follows one father and his 16-year-old son. The son got his first deer ever, and is donating it to HSH. For the last three years, McCombs has donated venison to food banks and other charities through the nonprofit Hunters Sharing the Harvest. The program partners with dozens of butchers statewide, paying processing costs and passing the meat along. Last season, the program sent 120,000 pounds of venison to food banks and homeless shelters. According to Executive Director John Plowman, it’s already on track to surpass that figure based on donations made during deer archery season earlier this fall. <If you count 1/4 pound as a serving, that is a lot of meals. Even if you think 1/4 isn't enough, it is still a lot of meals. Venison – it isn’t “grass fed” exactly, since deer are browsers not grazers, but it is all natural, no hormones or drugs, etc. It’s not dependent on fossil fuels for corn, etc…. Still, I’m sure the tree-huggers hate this program. Because Guns! Or Red Meat! Or something. I have written about hunting in Africa before… but it was about 10 years ago, and most of the links are now dead. So, with the death of Cecil the lion, it is time to revisit it. Why killing lions like Cecil may help conservation – CNN.com. Conservation is not free. And in Africa that holds true. It costs money to combat poachers. If an animal becomes a “problem” (by killing livestock or threatening people) funds are needed to relocate it, and hopefully funds are available to reimburse the owners of that dead livestock. Because if the owners are not reimbursed, and the animal is not relocated, then those folks whose livelihoods (and perhaps their lives or their family) are threatened will kill the problem animal on their own. Campfire is an organization that combats that situation. By raising money through sanctioned hunts, they pay for game wardens, secure habitat, deal with problem animals and reimburse folks in the event that an animal does kill some of its livestock. This is a fairly accessible article on Campfire from Global Eye. Global Eye is a magazine aimed at students sponsored by the Cambridge University Land Society, and seems to have the stamp of approval from the Royal Geographic Society. The CAMPFIRE movement, designed and managed entirely by Africans, began in the mid 1980’s. It encourages local communities to make their own decisions about wildlife management and control. It aims to help people manage natural resources so that plants, animals and people – the whole ecosystem – all benefit. It helps provide legal ways for such communities to raise money by using local, natural resources in a sustainable way. As a result, many communities now actively protect local wildlife, seeing it as a valuable asset. In some areas locals have even provided them with emergency food and water in times of shortage. Trophy hunting: About 90% of CAMPFIRE’s income comes from selling hunting concessions to professional hunters and safari operators working to set government quotas. Individual hunters pay high fees to shoot elephant (US$12,000) and buffalo and are strictly monitored, accompanied by local, licensed professionals. Trophy hunting is considered to be the ultimate form of ecotourism, as hunters usually travel in small groups, demand few amenities, cause minimal damage to the local ecosystem, yet provide considerable income. Selling live animals: this is a fairly recent development. Some areas with high wildlife populations sell live animals to National Parks or game reserves e.g. Guruve district raised US$ 50,000 by selling 10 roan antelope. Harvesting natural resources: a number of natural resources e.g. crocodile eggs, caterpillars, river-sand and timber are harvested and sold by local communities. Skins and ivory can be sold from ‘problem animals’ (individual animals who persistently cause damage or threat and can legally be killed). Tourism: in the past most revenue from tourists has not gone to local communities. During the 1990’s pilot projects have been set up and 5 districts now benefit from tourism. Development of specialist areas e.g. culture tourism, bird watching and visits to hot springs are planned. Some local people are employed directly as guides or run local facilities for tourists. Selling wildlife meat: where species are plentiful e.g. impala, the National Parks Department supervise killing and selling of skins and meat. However, this only raises fairly small sums of money. In fact now there are efforts underway to understand how best to copy the success of Campfire. The CAMPFIRE programme in Zimbabwe: Payments for wildlife services. But none of this will stop people from pushing to “END HUNTING!” Because they don’t really care about lions. Or elephants. They just love their liberal friends and want to claim more liberal credit.